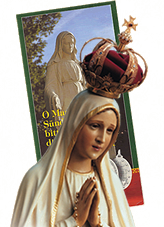 So spoke Our Lady to the novice, Catherine Labouré, in her apparition of November 27, 1830. Millions of people all over the world have worn the Miraculous Medal and obtained special graces ever since. By 1836, more than 15 million medals had been struck and distributed. By 1842, about 100 million people from all over the world had already received the Miraculous Medal. Even now, nearly 200 years later, there are many examples of persons who are blessed with these graces. At the Shrine of the Miraculous Medal you can light a candle in your intentions, asking Our Lady to intercede for you.